I am glad to announce that Toro compiles smoothly by using FPC 3.0.4 from Lazarus 1.8.0. There is only one issue when I want to run qemu from the IDE which I am going to report. Apart of that, no other issue has been observed. 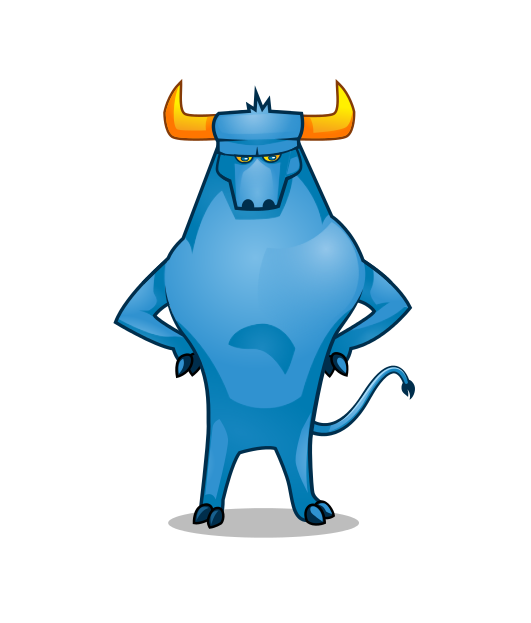 I am glad to announce that Toro will be in FOSDEM'18. This time I will talk about the improvement in the scheduler to reduce the impact of idle loops thus reducing the cpu usage of VMs. For more information, you can find the abstract here. Cases 1, 2 and 3 are in the kernel code. However, case 4 is when a user thread does idle work by polling a variable. So in this case, the solution would be harder since the scheduler has to figure out that the thread is only polling. Intel proposes different mechanisms to reduce the impact of idle loops [1, 2]. In particular, I was interested on the use of mwait/monitor instructions. However, I found this is not very well supported on all Hypervisors. So I have to base on the instructions hlt (halt) and pause. I want to highlight that hlt is a privilege instruction so only ring0 can use it. However, since in Toro both the kernel and the application run in ring0, hlt can be used either by the kernel or the user. Following cases correspond with the use by the kernel. First, I tackled case 1 by introducing the pause instruction inside the loop. This relaxes the CPU when a thread is getting exclusive access to a resource. Cases 2 and 3 were improved by using hlt which just halts the CPU until next interruption. To tackle case 4, I proposed two APIs to tell the scheduler when a thread is polling a variable. When scheduler figures out that all threads in a core are polling a variable, it just turns the core off. This is not always the case and sometimes Toro takes longer to turn off. This may happen when a socket is not correctly closed and it ends up by timeout. I need to experiment more to measure how much reaction the system losses when the core is halted. This recent work, however, seems very promising! This way Toro can run on Hyper-V, VMWare, QEMU, KVM and now VirtualBox. Hello folks! I am working on the bootloader of Toro to be able to boot on HyperV. First experiments seem very interesting! I could run the example ToroHello on top of HyperV. I found that the problem was the use of mm0 register in the bootloader. While this works well in KVM or QEMU, in Hyper-V the system hangs/crashes. By using a general purpose register like EBX, the problem is fixed and the kernel is loaded. I could not figure out why this is happening. Also, it was a bit tricky to wake up the other cores but, finally, I got them up. In the the near future, Hyper-V will be installed on every Windows in this context Toro can be an option of containers in a Windows environment. 1) Get a machine in Scaleway that will be used to run KVM and the Toro's guests. 2) Clone Toro repo. This contains the needed scripts to setup the host. 3) Run torokernel/tests/SetupCloudGuest.sh. This installs KVM and other needed tools. 3) Download the image that run the guest. For example, you can download TorowithFileSystem.img from here. The image must be copied to torokernel/tests. This workflow supposes that the development is done in other machine and the Toro image is just copied from your local machine to the host. That's all folks! You can get the guest's console by using a VNC Viewer to port 5900, or connect to port 80 of guest by connecting to port 80 of host. Figure1. VNC Viewer on Windows connected to the Toro guest. 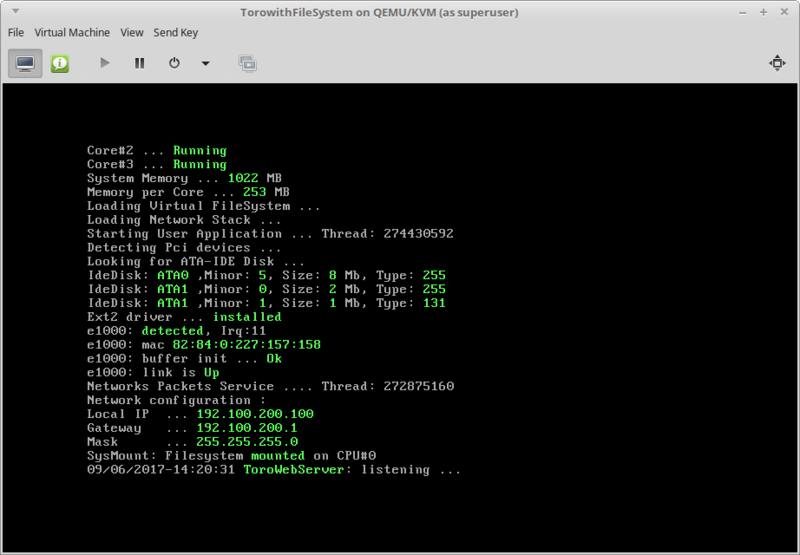 What you see is a TORO guest running on top of KVM. This example runs the ToroHello.pas which just prints a message to the screen. I am working to add more examples that use the filesystem and the network stack. Here I am writing down all the procedure to compile Toro in Ubuntu and run the example on KVM. This example, yet very simple, shows how easy is to deploy an application which is compiled within Toro kernel and run it in a VM without interference of an OS. Hi folks! These days I have been experimenting with Toro on KVM and Xen. This is still experimental work but it demonstrates how flexible Toro is. In KVM, I had very good results and ,with minor changes, Toro was running without any problem. In Xen, I tried with an HVM guest. However, I can't go further than booting the kernel. It seems that I am getting a lot of exceptions when Toro tries to wake up the cores in the system. I will focus on Xen in the next days. In addition, I am very interested in test Toro in Hyper-V so stay tuned! Hi folks! I spent this weekend trying to make the driver e1000 works. I started with this piece of code in 2011. I based on the code of Minix3. However, I could not go further than getting the MAC address, and then, I just gave up. I restarted last weekend and I did a great progress. I have almost the ToroPing.pas example working (see Figure 1). The key was to enable E1000_DEBUG in QEMU and put the hands in the code to understand as much as possible what the network card was doing. I will give more details about how enable debugging in QEMU in future posts. Figure 1. ToroPing.pas running with E1000 driver. I will continue progressing on E1000 in the following weeks so stay tuned! Hi folks! the purpose of this post is to highlight the work done on Torokernel Virtual Filesystem. I implemented three new VFS functions: SysWriteFile(), SysCreateFile(), SysCreateDir(). I will not detail the aim of these functions which I think is obvious. However, their semantics could vary from other kernels. For example, SysCreateFile() first tries to create a new file, if the file already exists it fails. In the case of SysCreateDir(), if the directory exists, it also returns with error. I added three new functions to give support to the new vfs features. These are Ext2WriteFile(), Ext2CreateFile() and Ext2CreateDirectory(). I moved all the pci device detection to a new unit named Pci.pas. This makes the code in FileSystem.pas much more clear. To ease the filesystem manipulation, I compiled a simple version of genext2fs for Windows 10. This is a common tool in Linux system which allows to create and populate an ext2 image. In Windows 10, I could not find such a tool so I decided to port it by myself. Again, this is a simple port which may not work in all cases. However, it is working fine in my tests. You can find an user guide here. I updated this example to show the use of new vfs features. The example still relies on ToroFiles.img which is mounted and used to get /web/index.html. I updated the application to log in the directory /web/logs each time that client requests a page. This is more or less all the progress done in the last three months. Future work is the implementation of Continuous Integration to compile the tests examples so stay tuned! Hi folks, this weekend I spent some time playing around Travis. This is a tool for continuous integration which is very well integrated into Github. Travis makes very easy to build and run tests after a push or before a pull request for a given branch. 1. To compile ToroHello example and generate the booting image ToroHello.img. 2. To run the image in Qemu and test if the example worked. I based on a previous work in https://github.com/nielsAD/travis-lazarus. So 1) was easy to do and I got a ToroHello.img compiled by using Travis very quickly (see Figure 1). Figure 2 shows the output from the serial port. We can see Toro's initialization at line 3574. To summarizes, in a very short time I was able to compile ToroHello and then produce a test to verify its correct behavior. This is a simple example but it allows to show how powerful might be CI for a kernel. So I am planing to use Travis in two different levels of testing. The first level is to verify the compilation of the examples after a push and/or pull request. The second level is to write specific tests to measure performance, leaks, wrong behaviors, exception faults, etc. This needs however a lot more experimentation. This generates a 8MB image named ToroFiles.img that contains the files in the directory ToroFiles. I executed the command inside the directory ToroFiles. In the next days, I will commit the example TorowithFilesystem.pas that uses this tool to populate ToroFiles.img. Together with the example, I will upload the instruction to run it so stay tuned! Hi folks! I have spent some time to write an example of the use of the toro virtual filesystem. After fixing a couple of bugs, I manage to get an example named TorowithFileSystem.pas. This example together with others is hosted in torokernel/tests. The example can be tested by following the instructions here. I also committed a small ext2 image named ToroFiles.img that contains the files to make it run. For the moment, I am providing the whole image. I hope to provide a tool to create ext2 images. The example is very simple, it opens a file name index.hml located in the ext2 image and then it listens on port 80. When a connection arrives, it sends the content of the file. Briefly speaking, it is a sort of webserver. The example is a slightly modification of the ToroHttp.pas example. The only difference is that this example read the content from a file. To illustrate, I highlighted the differences in code in read and green (see Figure 1). In red, we can see the initialization part in which the disk ata0 is dedicated to the core 0 (local cpu). By doing this, only core can access to this device. Once dedicated, we are able to mount the first partition, which is identified with the minor number 6, by using the ext2 drive. After this, we are able to open the file index.html and read it until EOF. Then, the content of this file is sent when a new connection arrives. Enjoy! I illustrated by using ToroHello, however, this also applies to all the tests. The changes are not still in master, instead I am working on the branch https://github.com/MatiasVara/torokernel/tree/supportlazaruscompilation. Fell free to clone and try. This only needs to install Lazarus 1.6.2 and FreePascal 3.0.0. Hi folks! I moved toro repository to github, i.e., https://github.com/MatiasVara/torokernel. I am trying to be more organized in the TODO work so fell free to check Projects and Issue sections. I am looking forward to more collaborative work!